Acting as a retail-entertainment consultant, StoneCreek Partners provided master planning support to this mixed-use district proposed for Panama City Beach, Florida, including tenant mix, leasing strategy, and hotel branded products. StoneCreek Partners provided conceptual design, market analysis, tenanting, and leasing plan preparation in support of this master-planned regional center. for the region that simply does not now exist. A planning issue in the conceptual plan was how to strengthen the connection between Big Box retailers, specialty Retail, and Restaurant Row districts that comprise the downtown area of the plan. 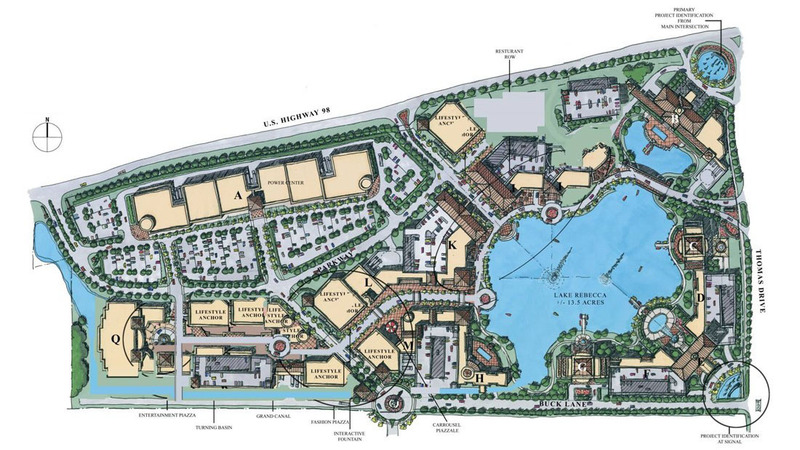 Rebecca’s Landing mixed-use district is envisioned to feature a top line-up of restaurants in Panama City Beach and the Bay County region, with the restaurants situated overlooking Lake Rebecca. Each of the restaurants share terrific views of the end-of-evening sound-and-light show that emanates from the center of the lake.